With the film Rio set for release shortly, Rovio has partnered exclusively with Amazon to bring the hotly anticipated Angry Birds Rio to the Android platform. Interestingly, Rovio has decided not to use their old partners GetJar for the launch of this eagerly awaited game; instead it will be available exclusively through the Amazon Appstore. It is unclear at this time exactly how long this exclusive agreement will last and when the game will debut in the Android Market. Suffice to say this is a major coup for Amazon's still nascent app store. The developers of Rovio have been working with 20th Century Fox to bring the heroes of the film Blu and Jewel - two rare macaws - to life. Their mission, should they choose to accept it, will be to save the original Angry Birds, who have been taken captive in the magical city of Rio. The game will launch with 60 dedicated levels themed around locations found in the film, with more content to follow thereafter. Rovio has indicated that the game will launch on March 22nd, while Amazon has already put up a temporary page. Rovio also announced that ad-free versions of the original Angry Birds and Angry Birds Seasons will be available through the Amazon App Store as well. Angry Birds Android on Amazon App Store. AUSTIN, Texas/ESPOO, Finland- March 14, 2011- Rovio today announced that the highly anticipated game Angry Birds Rio will be introduced for the Android platform exclusively in the Amazon Appstore. Developed in conjunction with Twentieth Century Fox, Angry Birds Rio features the animated stars of the studio’s upcoming motion picture, RIO. Additionally, for the first time ever on the Android platform, fans of Angry Birds games will have the opportunity to purchase and download ad-free versions of Angry Birds and Angry Birds Seasons. Both will debut only in the Amazon Appstore. "The Android platform has seen phenomenal growth, and it’s great that new avenues for app distribution are opening up," said Mikael Hed, CEO of Rovio. "The openness of the Android platform works for the benefit of consumers and developers alike. It has been delightful to team up with Amazon to bring the Angry Birds franchise to this great new application marketplace." "Amazon is thrilled to work with a leading developer like Rovio in offering our customers Angry Birds Rio for Android exclusively in the Amazon Appstore," said Aaron Rubenson, category leader for Amazon Appstore. "We think Angry Birds Rio is sure to be an instant customer favorite." "Angry Birds Rio is a fun and interactive way to introduce millions of fans to the exciting world of ‘RIO,’ and we are proud to work with both Rovio and Amazon to make this experience available to users on the Android platform," said Peter Levinsohn, president of new media and digital distribution for Twentieth Century Fox. 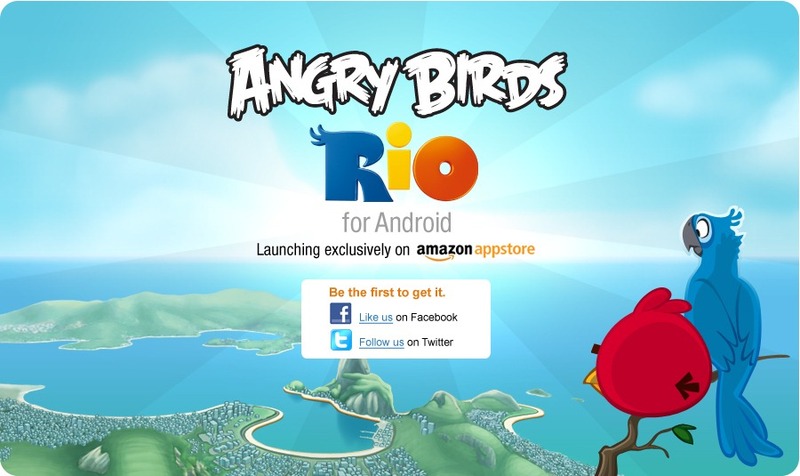 "The Amazon Appstore will be a great new way for consumers to download all their favorite Android apps, and we’re excited to offer Angry Birds Rio as one of the first pieces of content to be made available to consumers through this new store." In Angry Birds Rio, the original Angry Birds are kidnapped and taken to the magical city of Rio, where they eventually escape their captors and set out to save their friends, Blu and Jewel- two rare macaws and the stars of the upcoming Fox motion picture, RIO. From the creators of Fox’s blockbuster ICE AGE motion picture franchise, RIO debuts in theaters worldwide on April 15, 2011. Angry Birds Rio will launch with 60 dedicated levels, with more content to follow via app updates. Angry Birds Rio will be available for download on Android phones and tablets at amazon.com/angrybirds.